Calypsonian Selwyn âJinnyâ Delpesche is going for the hat-trick in the PâTani Masâ competition, but he still has one year to prepare and is currently savouring this yearâs triumph. Jinny is however no stranger to the winnersâ circle. He also holds memories of winning competitions in Biabou in 1994 and in Carapan in 1995, and as a part of the Calypso Theatre, he hopes to make it in the national calypso arena this year. According to Jinny, his song âLife Hardâ which won him the judgesâ nod this year, is about trying to convince persons to keep away from gambling, smoking and other bad habits. âYou donât have to get into those things just because life hard,â says Jinny who also strengthens his concerns in âHaters of Progressâ, his second song for PâTani Mas 2004.
âHaters of Progress,â he says, âis about those who hate to see something progressive.â The banana farmer of 15 years revealed to SEARCHLIGHT, in a telephone interview from the block in Evesham, that he is still, âoptimistic about the future of bananas in St.Vincent and the Grenadinesâ, and is not giving up on bananas. So dedicated is he that he has also written a song called âBanana Unificationâ. Though Jinny writes his own songs he seeks the expertise of his friend and calypso lover Cefus Toney, whom he says, helps make his songs better. Jinny has a few recordings. 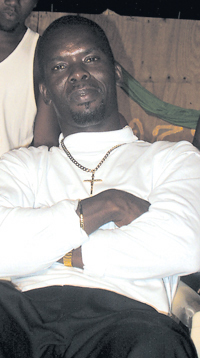 âKeep the Faithâ and âSing me a Songâ his 2003 winners, were recorded by Junior Sutherland, while this yearâs recordings were done by Kenneth âVibrating Scakesâ Alleyne. Other songs include âAfrican Socaâ and âPaddle Yo Own Canoeâ. The optimistic calypsonian gives encouragement and advice to youngsters, urging them to take part in Carnival but to always do something constructive. Jinny says that he hopes to do some soca next year but he is still awaiting the EC$1500 which he won at PâTani Mas 2004 which could help him prepare.